Difference between revisions of "Eclipse Day China"
Non-official satellite site page is eclipse-china.github.io/Day/. 11 For Bloggers and Users of Twitter, LinkedIn, Flickr, Weibo, Weixin etc. Eclipse Day China is 2 weeks away. We have venue, 99 registered, 22 presenters, 5 organizers and 2 volunteers... But no sponsors (except for Eclipse itself). This is call for support! Half of Eclipse members are in China or have big Chinese clients. Please support Chinese Eclipse event as you do elsewhere. There is no minimum requirement. We don't really need much money (only snacks, best presenter & topics awards, maybe some lucky draw for 50$ present, etc) Help as much as you can. The most important is that you show support for Eclipse. We still have 2-3 presentation slots left. Welcome if you have something to say to Eclipse Community in China! And finally, it will be great joy if we find venue sponsor to hold up to 200-300 software developers and architects ! 距离Eclipse Day China活动还有2周时间，我们已经有99名注册人员， 22名演讲人，5家合作主办公司，2名志愿者， 我们需要更多的赞助. Eclipse Day China in Beijing on 2013 June 29 is a free event supported by the Eclipse Foundation. This event will target on the IT developers and Eclipse members, and the experts and senior consultants from leading IT companies will share the experiences of Eclipse open source projects, Eclipse demo, and discussing the technical issues with the participants. This event will also provide a good opportunity and platform for the Eclipse members and developers to discuss and communicate. The event is free, please register ASAP to reserve your seat. 此次活动免费，因席位有限，请务必尽早注册预留席位。 For guests without registration fee of 100 rmb is applied. Contact organizer if you want to join via WebEx. For smaller DemoCamp on June 20th, see Beijing Thursday. -	ThoughtWorks, Global leading customized enterprise software design and delivery company. If we have money left, we will return or donate to Eclipse (or next event) as you wish. 对于有关活动的任何问题、建议和想法，欢迎直接向本次Eclipse编程马拉松协调人金明剑或者本页面上的其他组织者发信。 This hackathon will be hosted by one of co-organizers, Jin Mingjian. If you have any suggestions, ideas or questions, don't hesitate to sent emails to him  or other organizers on this page. UPDATE: Suggested time slot duration is 30 minutes (including Q&A, preparation for next presenter). 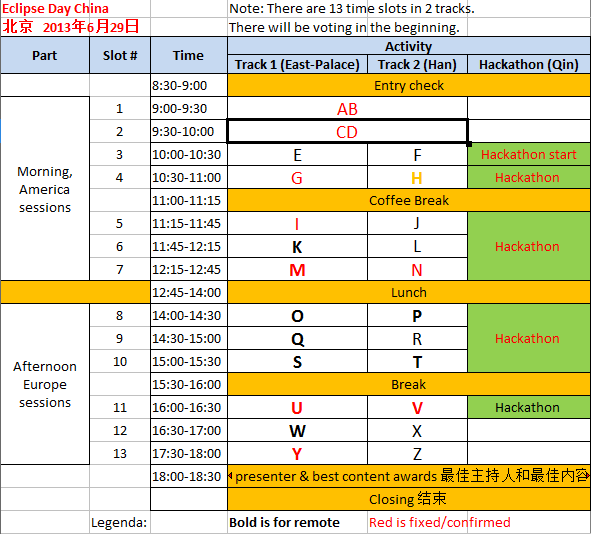 We are to run 2 demo tracks + Hackathon track. If you added your demo to the list above, please add a short abstract to this list so people know what you will be talking about. Model-based software development automates boilerplate code writing by code generation, but restricts developers - often severely - when it comes to manual editing and refactoring at code level. Not so with UML Lab. 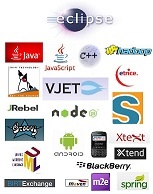 UML Lab is based on Eclipse RCP and is deeply integrated into the Eclipse IDE. It re-uses existing technologies and combines them in a new, productive way. In the demo I'll show how UML Lab seamlessly combines modeling and coding with an intuitive UML diagram editor and next-gen round-trip engineering. I'll start with importing a legacy software project to get a nice UML class diagram and continue editing model and source code - each operation updates the other instantly. I'll show how to gain overview by reverse engineering, boost your productivity by combining modeling with coding and utilize the full potential of model-based software development through truly agile modeling and programming. You don't want your IDE to propose java.awt.List as import when you need java.util.List? This talk will show you how to get rid of the proposal and how to use your IDE effectively to concentrate on your work.It will cover the most interesting features from Eclipse as Java IDE. Their default settings give you a good start but there is a lot more to discover to make you more productive. This includes syntax highlighting, editor, compiler and code completion settings. In addition we will try-out the most useful refactoring actions and shortcuts. After this talk you have an overview on how to setup your IDE in a way which will support your working style and will make you complete your work much faster. Eclipse is not only used as a platform for software engineering, but also for systems engineering. A number of graphical notations for these disciplines exists, but especially for the newest approaches graphical editors are few (EAST-ADL, AUTOSAR). In this talk we will show how we used model driven technologies (Xtext, Xtend) to efficiently create a number of graphical editors based on Graphiti. The technology implemented in the IMES research project is a good demonstration on how custom DSLs improve your development process. Six different graphical editors are all concisely described with a domain specific language (different from the Spray! project), making refactoring, bug fixing and implementation of new features very efficient. Xtend, Eclipse's new statically typed programming language for the JVM, offers many possibilities for developing very concise and declarative APIs - aka internal Domain-Specific-Languages (DSL). Xtend compiles to readable Java source code, allowing bi-directional integration with existing code which runs on any JVM. After giving a short explanation about the differences between external and internals DSLs we will show some real-world examples. These examples will reach from significantly increasing the conciseness of your code over automating design patterns to operator overloading. You will learn how Xtend can be integrated into your projects seamlessly. This presentation shows our real-life experience using Eclipse in our projects to get the most out of Groovy's flexibility on live deployed applications. The traditional development of a web application in Eclipse requires a first phase of creating/editing the web project and a second phase of deployment on an application server such as Tomcat. this life cycle doesn't take advantage of Groovy's capability to be edited and reloaded on the fly on live systems. In this talk we propose the idea of creating a project that points directly to the web application running under Tomcat. The separation between source files and deployed files disappears, changing the traditional java web application life cycle. Therefore we can harness the power of the IDE (above all debugging) and to maintain the capability to make changes on the live system without redeploy. During the demo we are going to show a case study based on an application for Funded Projects management currently in use by an Italian major research organization . I will first go over the features of the JDT, then explain the basic structure. I will then walk through some demo code that analyzes a Java source file and can makes some changes. Michael will be conducting a demo-oriented presentation. He will be walking you through STS so you can understand Spring support for Eclipse, based on the most common Spring features: XML configuration, annotations, refactoring of Spring beans, Aspect Oriented Programming. The Eclipse project eTrice, a sub project of the Model Development Tools, delivers an implementation of the ROOM (Real-Time Object Oriented Modeling) language together with textual and graphical editors, code generators for Java, C and C++ and target middleware. After an introduction of eTrice and ROOM I will do a little Tool Demo. The maximum number of attendees (including speakers) is 100. We got official Eclipse Day status on May 24th. 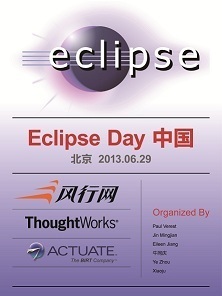 The old DemoCamp page (with almost 3000 views) is Eclipse_DemoCamps_Kepler_2013/Beijing. For Bloggers and Users of Twitter, LinkedIn, Flickr, Weibo, Weixin etc.